Dr. Noel Browne 1915-1997 was an Irish politician, doctor and author who lived for some time in the 1920s at Church Lane in Ballinrobe and attended the local Christian Brother school. He mentions some of his, and other pupils' experiences in a Chapter Growing up in Ballinrobe in his memoir Against the Tide published 1986. His father had worked with the ISPCC as an inspector throughout Ireland and would have been exposed to much poverty and ill health, and it was thought that he was responsible for bringing tuberculoses into the Browne household. In his book he discusses the hard work of his parents and, what he considered the cruel treatment of his mother by her own family, when they had moved to Ballinrobe after his father died. Recalling his family’s destruction by disease inspired his ambition to become a doctor, transgressing centuries-old sectarian rules which would hamper his future progress. Their circumstances in Church Lane were dire and when his Mother fell ill the children took over running the household, including drawing water from the Robe River. Joey, the eldest, had a back problem, but got a job as a messenger boy in a local grocery shop. Apart from the pittance he was paid, the free bag of bacon bits, which had fallen beneath the bacon-slicing machine, helped them to survive. They did however, experience happiness in Ballinrobe for a time before their Mother fell ill. She eventually realised how serious her condition was, but having no money for medical care, she decided to auctioned off their few possessions and moved the family to England. Within days of their arrived she died. She had known that the family, as orphans and paupers in Ireland, could be split up and sent to the Workhouse or Reform Schools of which she, like many more abhorred. 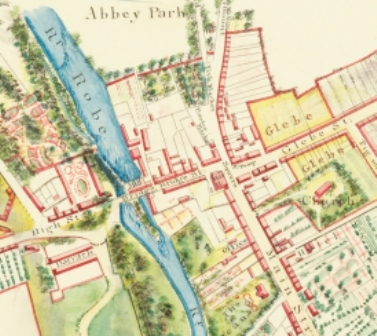 After their move to England, and after a reasonably good education in Ballinrobe, Browne went to school and eventually won a scholarship to a Jesuit school near Windsor. While studying he met and became friendly with a wealthy lad from Dublin. This young man, Neville Chance was the son of a well known Dublin surgeon, who saw Browne’s potential and paid his way through Trinity College, Dublin where he studied to become a Doctor and developed an interest in politics. He felt this was the only want to bring about change and improvement of the situation for so many people. He had seen his father, Joe, his mother and younger sister Annie die from the disease and two of his siblings and himself contracting it, with his elder brother Jody developing a deformed hunchback spine. In 1940 Browne contracted tuberculosis himself, recovered and passed his medical exams in 1942. He started his medical career at Dr. Steeven’s Hospital Dublin. During his medical career he witnessed the ravages and tragedy of TB and its prevalence, particularly in poorer areas in Ireland. He decided the only way to improve the situation was to join politics. He joined the Irish Republican party and was elected to the Dáil in 1948. It was a surprise to many when he became one of only a few chosen as Minister for Health on their first day. However, he soon discovered that the ultimate power in Ireland lay, not with elected politicians but with the bishops of the Catholic church, whose opulent lifestyle contrasted poignantly with the terrible hardships of the masses. Their actions to prevent free medical care for mothers and children and to demonise him from the pulpit left him disillusioned with religion and the Irish Parliament. In 1946 a White Paper on health had been prepared by the previous government. Browne set about implementing the changes it suggested. His campaign coincided with the development of new drugs that eliminated long hospital stays and reduced the impact of this terrible disease. He introduced mass free screening for tubercelosis suffers, which dramatically reduced the incidence of TB in Ireland. In the early 1900s tuberculosis was often referred to as 'consumption' or 'the decline'. The disease affected practically every family in the country. The causes of the disease were poor housing, a lack of proper sanitary facilities, overcrowding and sub-standard medical services. He sold department assets to finance his campaign. This helped reduce the incidence of tuberculosis with dramatic results in Ireland. At 32 years of age, he was a crusading and dynamic innovator, now using hospital sweepstakes funding (ticket revenues came from the US and Britain as well as Ireland) to fund a network of sanatoriums, including one at Creagh, just outside Ballinrobe on the Castlebar Road. Creagh House once lived in by the local landlords, the Knox Family formed part of the complex. This was to exploit the possibilities opened by the arrival of the BCG vaccine. He also set up the first Irish national blood transfusion service. In 1951, his Mother and Child Scheme ran into opposition, with the Catholic Church representatives amongst others, and it actually brought down the first Inter-Party Government of John A. Costello. Browne proposed introducing a scheme which would provide free maternity care for all mothers and free medical care for all children up to the age of sixteen, regardless of income in 1950. This scheme met with ferocious opposition from the Catholic hierarchy. The Catholic Church opposed the scheme because they believed that it was the right of every parent to provide health care for their child. They also feared that it could pave the way for abortion and birth control. Doctors also disapproved of the scheme because they feared a loss of income. Browne refused to back down on the issue but received little support even from his Cabinet colleagues. He found himself up against a powerful opposition that spanned GPs concerned that their incomes might be threatened, and colleagues in government who, in turn, were probably under pressure from lay Catholic elements. His controversial mother and child scheme brought down the first inter-party government of John A. Costello in 1951. In April 1951 Seán MacBride of Clann na Poblachta was forced to dismiss Browne from the government. The following month an election was called and Browne was elected to the Dáil as an Independent TD and finally retired during the 1982 General Election. He was a controversial figure throughout his life and represented five different Partys over his political career, having founded two of them. He was also qualified as a psychiatrist and worked with the Eastern Health Board in Ireland. Brown wrote his autobiography Against the Tide which was published in 1986 and launched at Kenny’s of Galway but ,like all other events in his life, this proved controversial also. It is a frank and engaging but, is an unromantic expose of Irish society and particularly relevant to-day with all the recent cover-ups and Church scandals surrounding Child Abuse. To some he was a dynamic radical who stood up to conservative and reactionary Catholicism. To others he was an unstable, temperamental and difficult individual who was the author of most of his own misfortune. However, he could have had an easier life abroad, but he choose to stay and help Ireland develop in spite of itself, and at a considerable personal cost. No 14 - Dr. Brown’s Home on Church Lane on BTC Heritage Walk. Personal Interview with Dr. Noël Browne, Bray and Galway. Bro. Anselm Conway was a gentle, quaint man who inspired love in all who knew him. 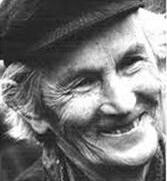 In July 1946, in the TB sanatorium in Ballinrobe, which he visited weekly, he met Kathleen Kilbane aged 11, who was an orphan. Because of people's dread of TB, and the long distance from her home in Achill, Kathleen was to have few visitors. Bro. Conway took her under his wing. No More Tears in My Eyes is his deeply moving account of Kathleen's last year of life. This page was added by Averil Staunton on 02/03/2011. Who was Noel Browne's mother and what are her roots to Hollymount, Co. Mayo. Thank you for your query and I have copied it on to Mr. G. Delaney of the South Mayo Family Research Centre in Ballinrobe. He will get back to you shortly. Noel Christopher Browne was born 20 December 1915 in in Waterford, the son of Joseph Browne and Mary Teresa Cooney who married in Roundfort RC church on 8 September 1905. Noel's father was a police constable and Mary Teresa was the daughter of a retired constable, Patrick Cooney, a native of Co. Galway. Mary Teresa's mother was Catherine Moran. 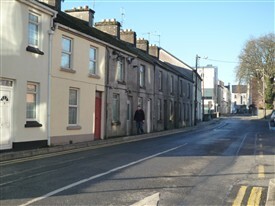 Mary Teresa was baptised in Roundfort church on 1 December 1882. 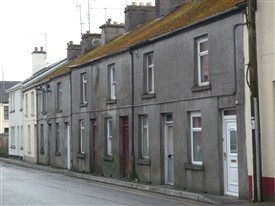 A plaque marks the house in which they lived in Hollymount - it's beside the Cois Abhann Community Centre on the Main street.